Repsol Honda Team rider Marc Márquez defended his unofficial title of the King of Texas today, topping off five pole positions in a row with a fifth win in a row out of all five MotoGP races at Circuit of The Americas. Holy crap. Márquez’s likely rival, Movistar Yamaha rider Maverick Viñales, wasn’t going to continue his streak of wins this season. Viñales won the season’s first two races and qualified in second place to start next to Márquez, but he crashed out on just lap two of today’s race. Viñales’ teammate Valentino Rossi also had a bit of a moment on track seven laps into the 21-lap race. Monster Yamaha Tech3 rider Johann Zarco forced Rossi off-track at COTA’s esses in a battle for third, causing Rossi to shortcut one of the turns. Stewards determined that Rossi gained an advantage from shortcutting the turn and gave Rossi a 0.3-second penalty to be applied to his time after the race. Márquez’s teammate, Dani Pedrosa, shot past the three front-row qualifiers into the lead at the very start of the race. However, this soon became a highly entertaining teammate vs. teammate battle, with Márquez taking the lead with 13 to go. One lap later, another fan favorite was soon out of the race. Reale Avintia rider Loris Baz won us all over Saturday with an epic save in qualifying, but crashed out of Sunday’s race just before the halfway point. Pedrosa wouldn’t let up on Márquez, but ultimately, Pedrosa fell far enough behind for Rossi to pass him towards the end of the race for second place. Márquez cruised home to protect his 100-percent win rate at COTA, and Rossi’s second place here—which stood despite his penalty—after two other good finishes means he now leads the season championship by three points. 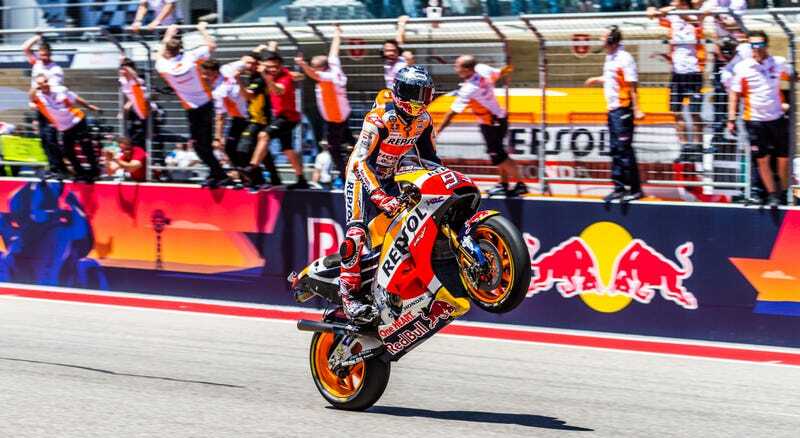 It is utterly incredible that only one rider has been able to win here, but here we are: Márquez did it again. Will he keep this going until he retires, or will someone else upset his streak next year?